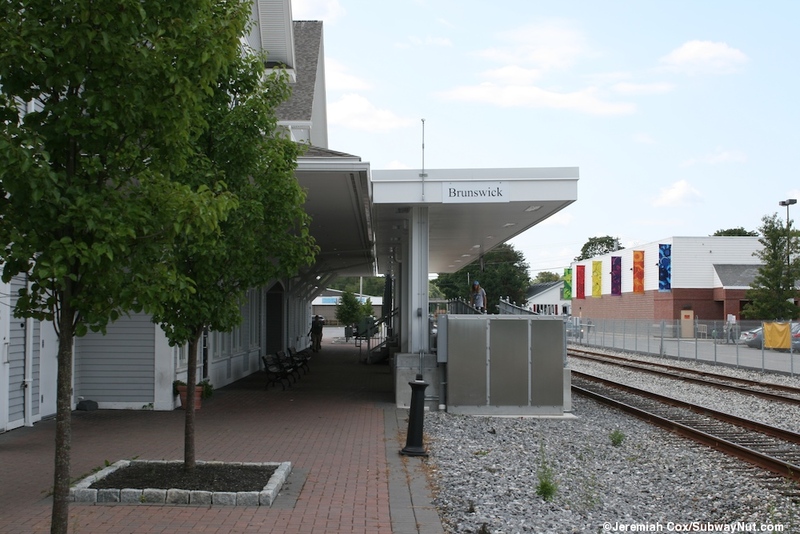 Brunswick, Maine became the terminus of the Downeaster on November 1, 2012 after a $38.3 million High Speed Intercity Passenger Rail (HISPR) Grant under the Recovery Act extended service 29 miles from Portland. 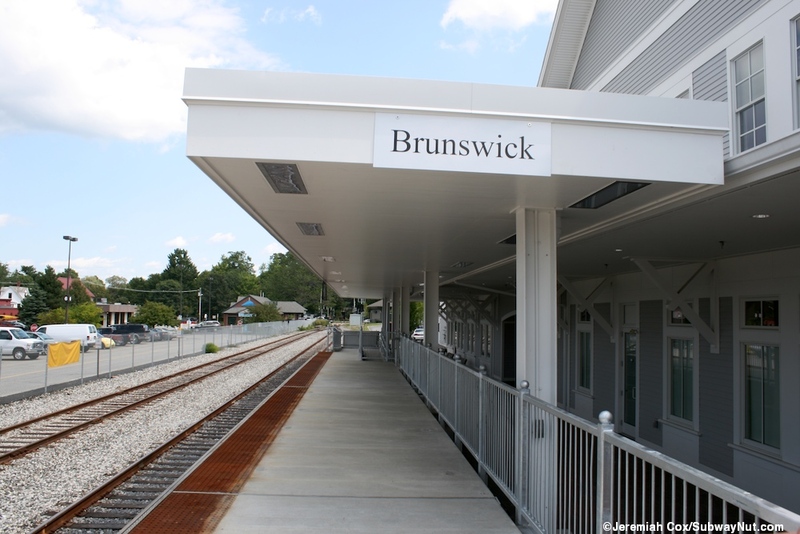 Train service began in November 2012 with two round-trips a day to Boston and a single round-trip only to Portland (these trains running just 29 miles will run the shortest distance on Amtrak) because of NIMBYism blocking the building of a proper layover yard facility in Brunswick. 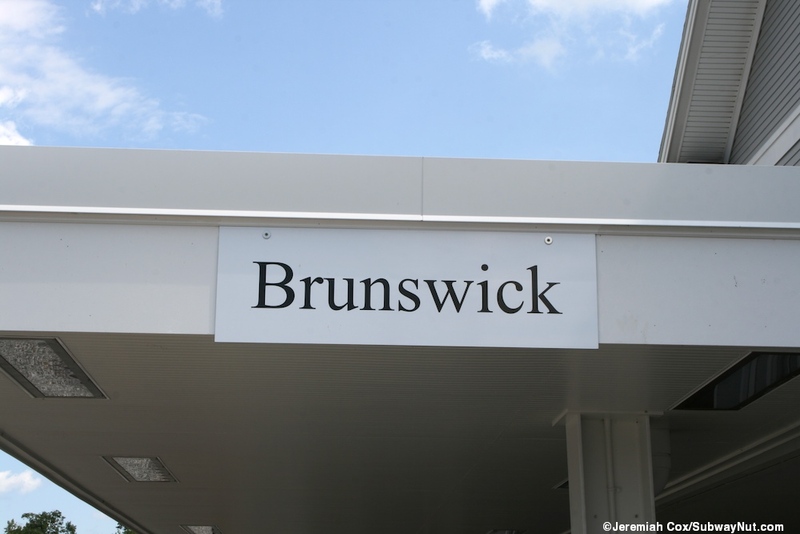 Starting with the October 2013 schedule change the deadheading round trips to and from Portland were illiminated and now Brunswick receives just two round-trips per day. 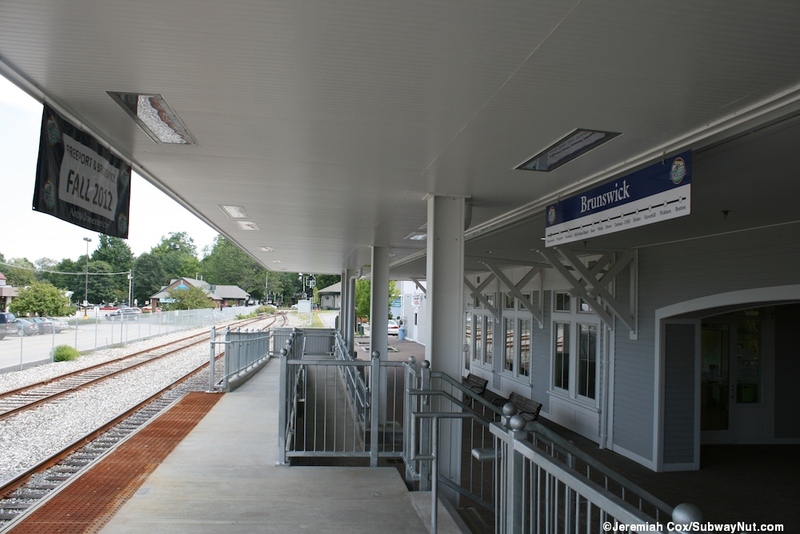 The new station's high-level platform was dedicated on May 14, 2012 (along with the intermediate stop in Freeport), it was originally used by the Main Eastern Railroad that (as of the 2014 season) provides connecting service from the Downeaster on Fridays through Sundays to and from Rockland, Maine, making intermediate stops. 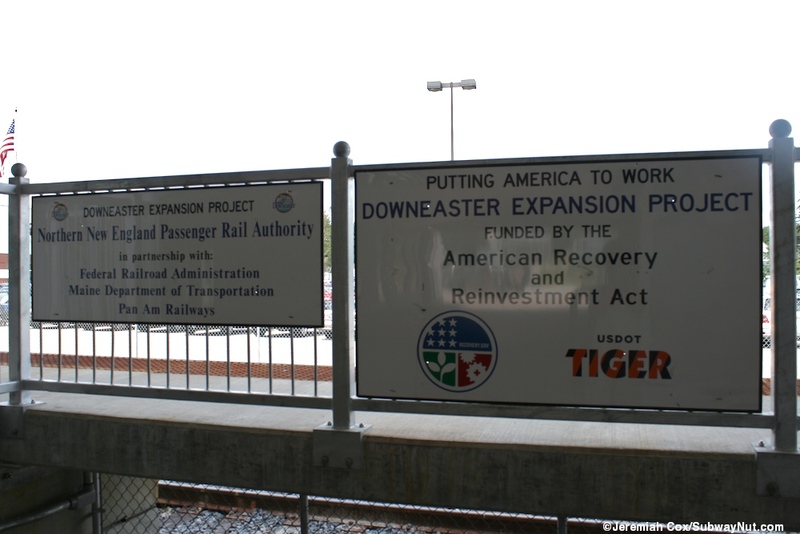 The Main Eastern Railroad, a tourist railroad running one or two excursion trains per day to Rockland (via Bath and Wiscasset) offering one-way fares during Summer and Fall on Wednesdays thru Sundays started using the new platform first beginning with its 2012 season. 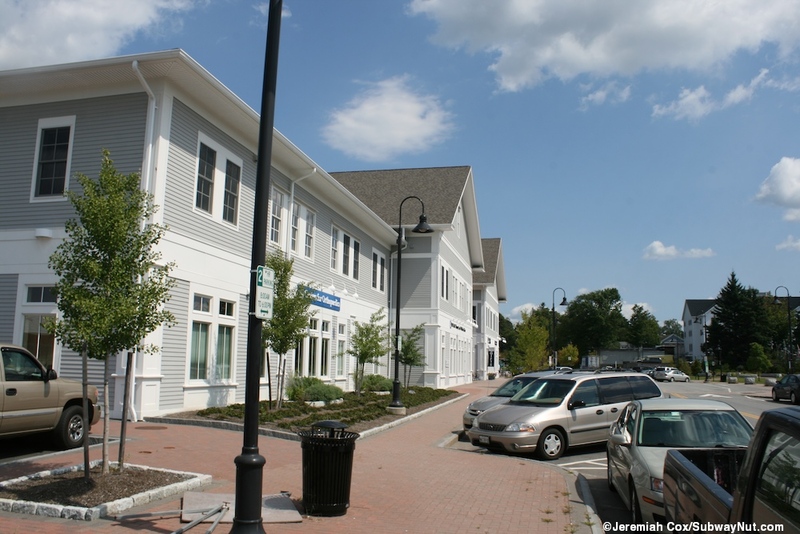 For the 2013 season, the schedule was reduced to Fall Only with one round-trip per day, and doesn't offer travelers a seamless ride all the way to Rockland another 57 miles down the coast. 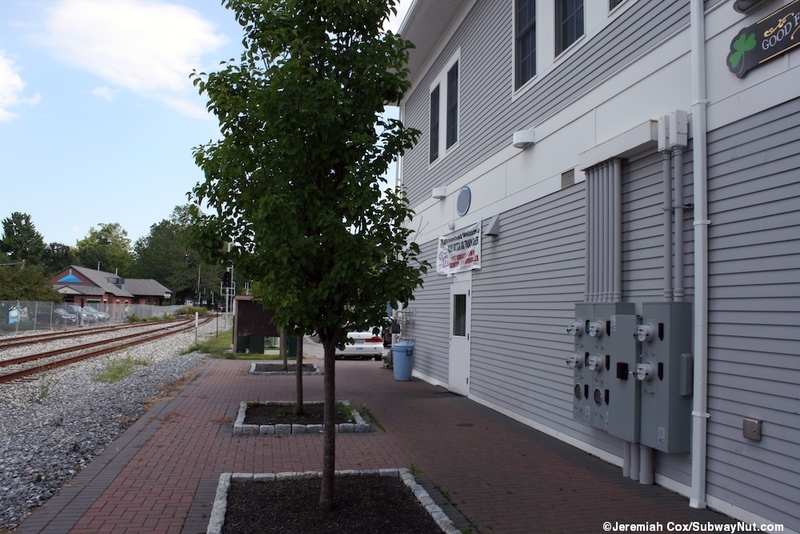 Trains used to stop until the 2009 season on the other side of Union Street closer to Cedar Street. For the 2010 and 2011 seasons they used temporary ramps for boarding at the location of today's modern high-level platform. 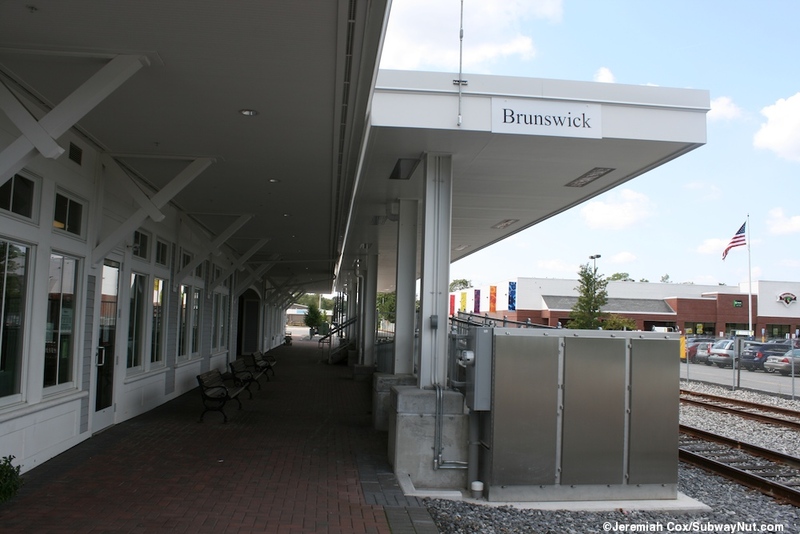 The new rail platform is located at Brunswick Station, a new mixed-use development which started opening in Fall 2009 and has now been completed. 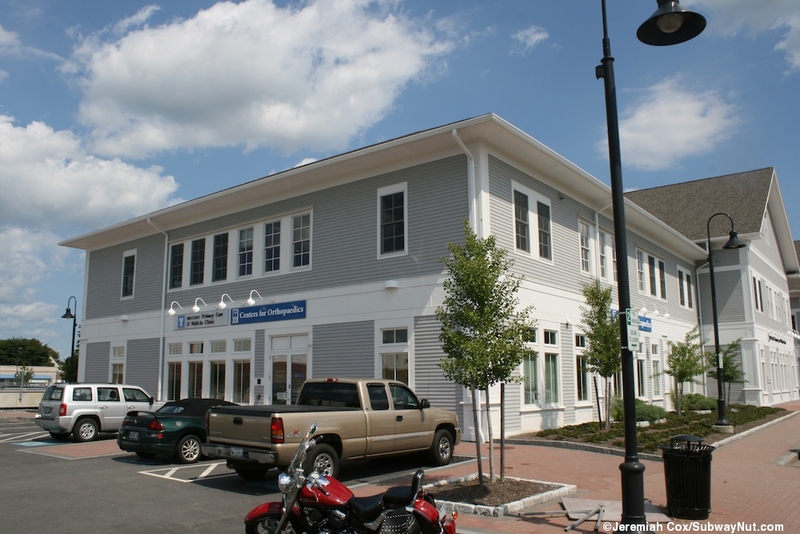 The development is built on what was once vacant land in the remains of railroad yards. The new high-level platform begins with a ramp and then a few steps just beyond the grade crossing of Union Street. 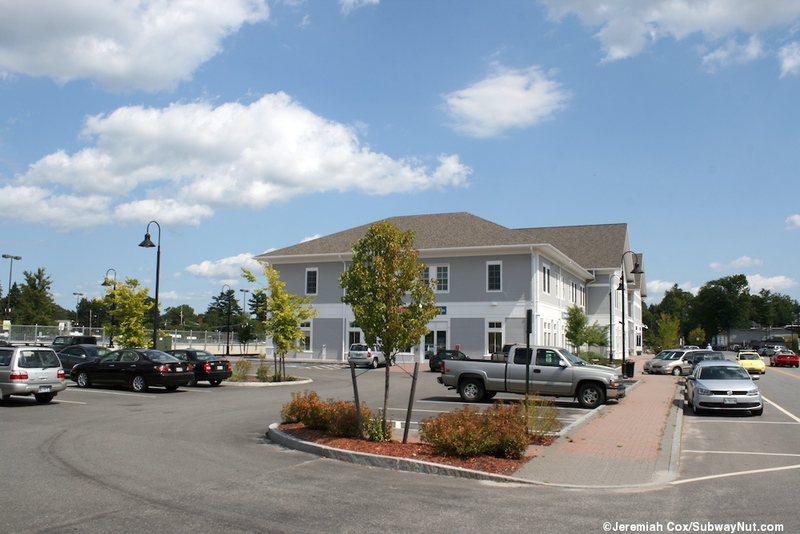 This platform then runs along the parking lot for the new Brunswick Station development with a silver fence and tactile warning strip that looks like it is already rusting. It has simple black lampposts. 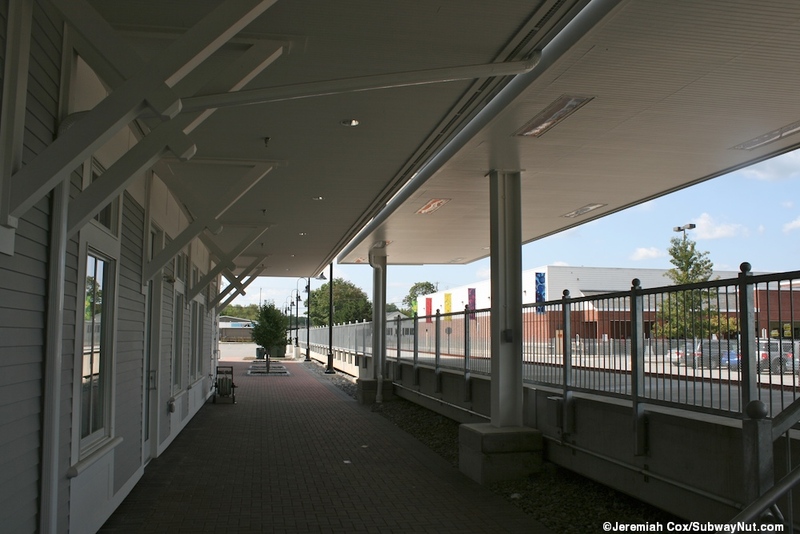 At the other end of the platform it gets a white canopy with built in tube florescent lights. 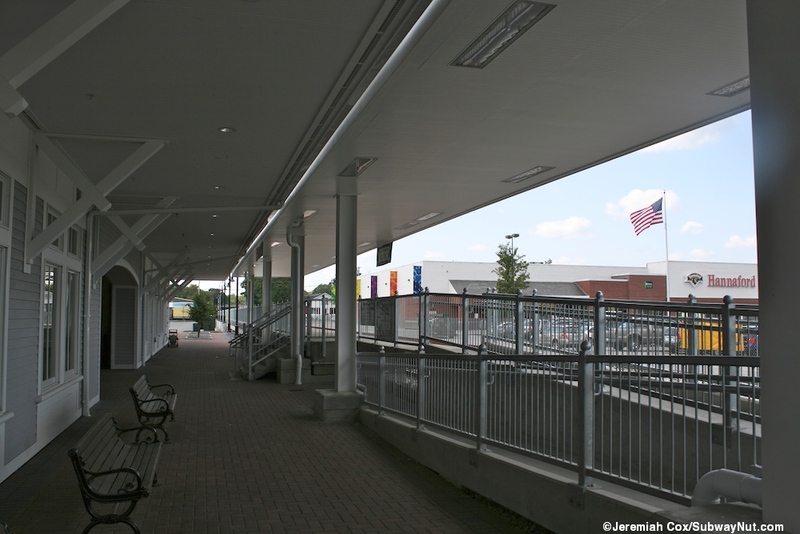 This is right outside the main central buildings of the Main Street development, and the platform canopy aligns with porches that extend from the building. 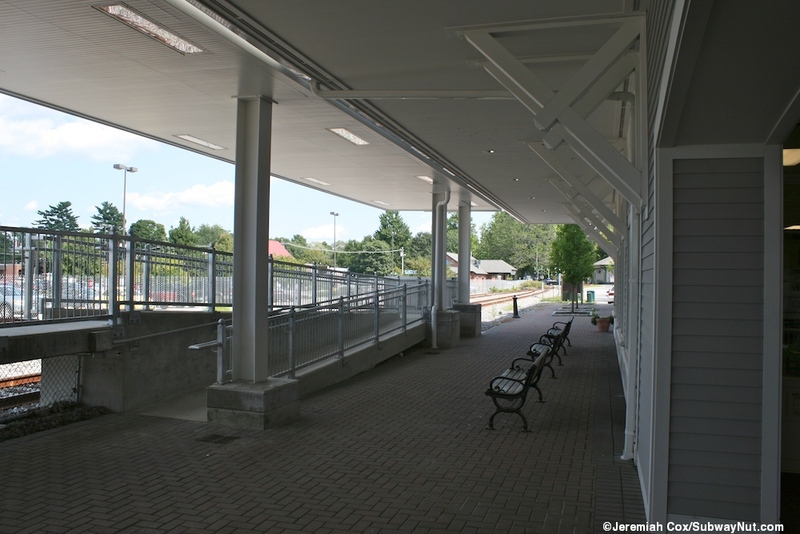 Here there is a wider staircase and another ramp off the platform down to the development where a central outdoor area leads to Station Avenue (where Concord Coach Stops). 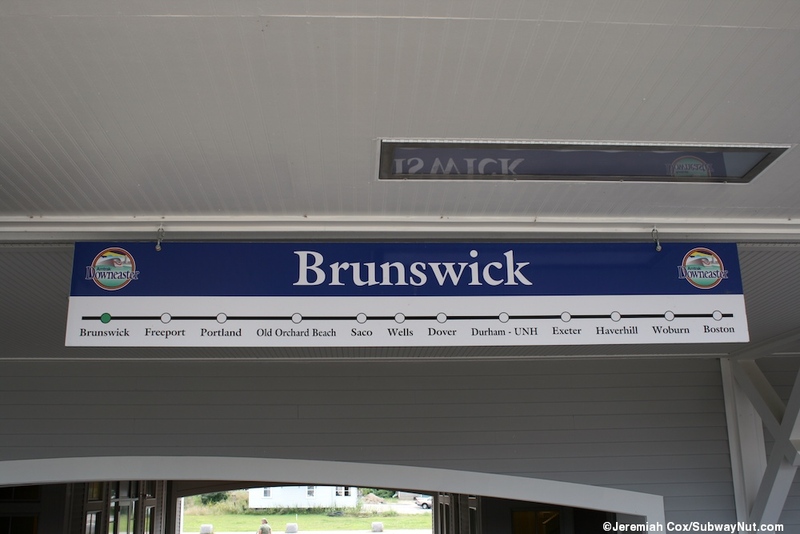 This area has the only three station signs two are small Serif font signs saying Brunswick on the ends of the canopy (one isn't even visible from the platform). 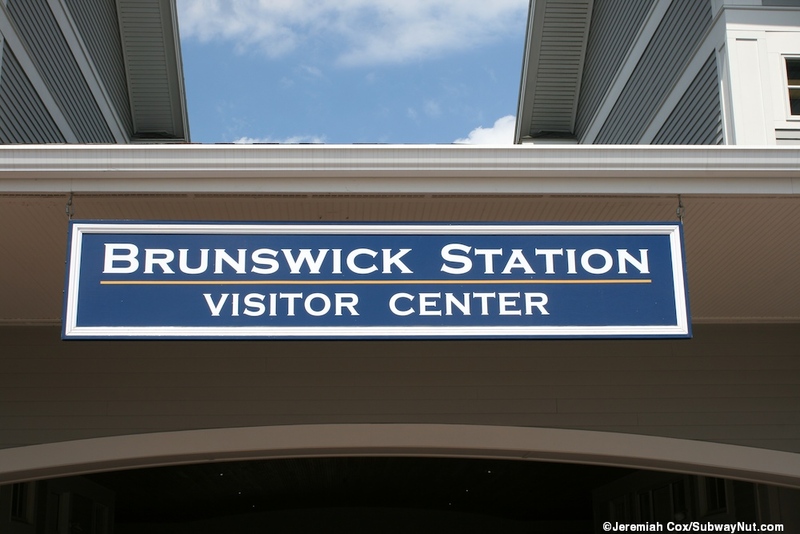 The final one is in the same font and says Brunswick on a blue background with a strip map of the soon to be 12 station Downeaster Route beneath. 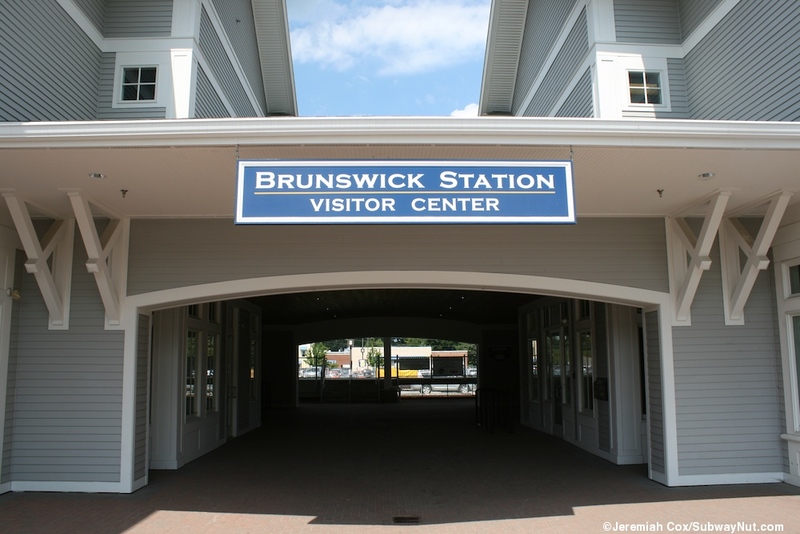 Just beneath the platform area, inside a small portion of the Brunswick Station building (which extends east of the platform) is the Downtown Brunswick Visitors Center. 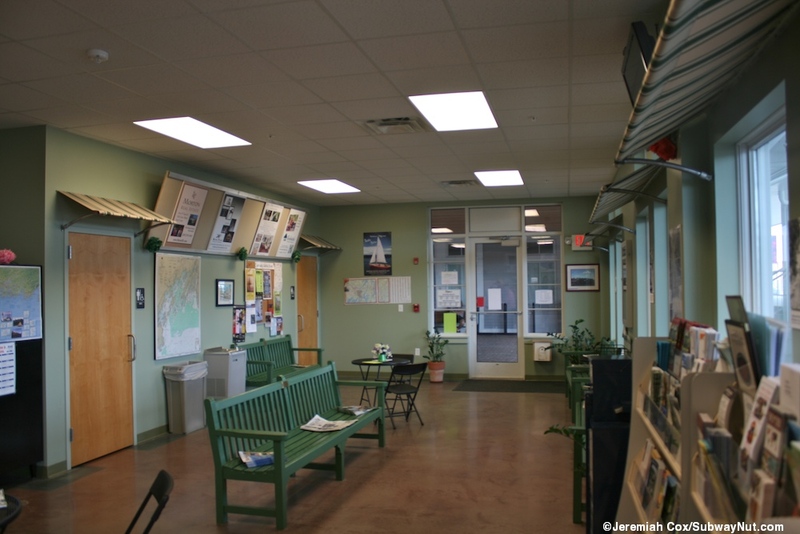 This will serve as the station's waiting area. Inside are a few benches and tables. 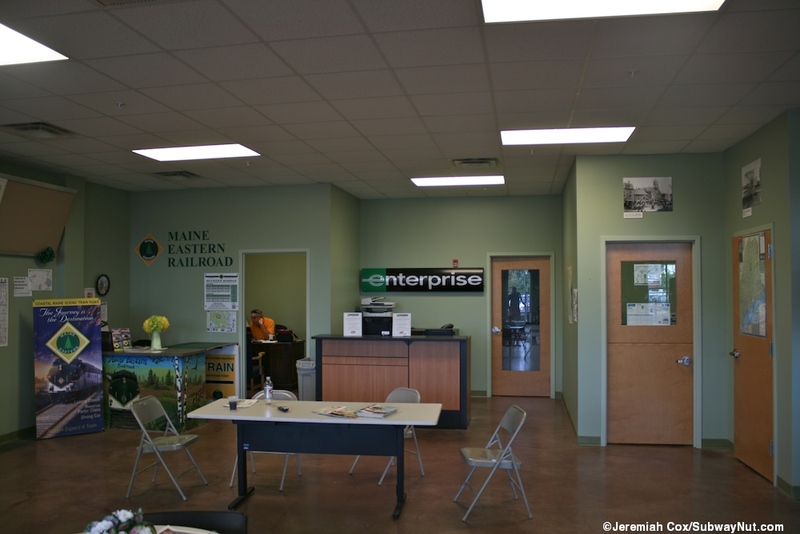 There is a desk for Enterprise Rent-a-car and an office for the Main Eastern Railway. 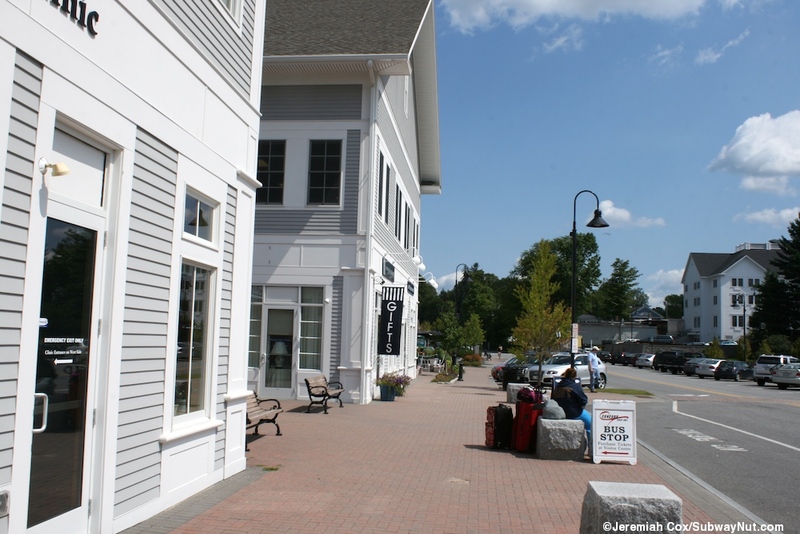 The sign for the Concord Coach stop says tickets can be obtained here so the visitors center desk must sell them. 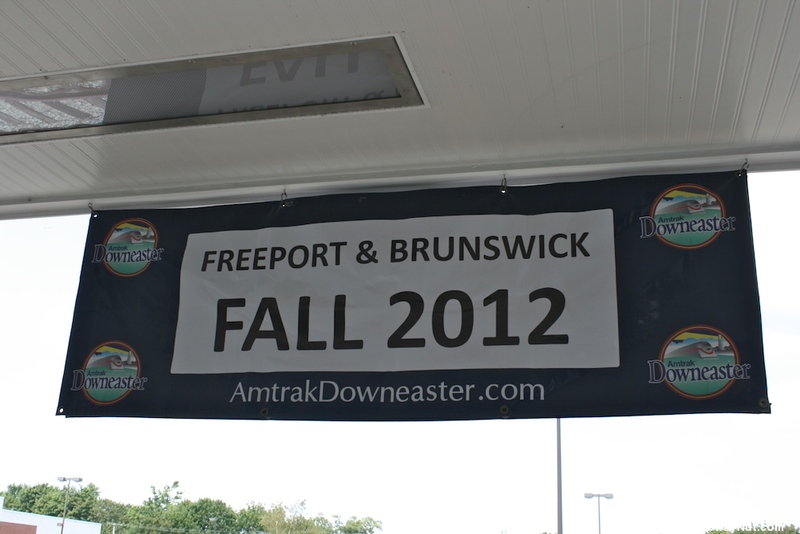 The station is unstaffed by Amtrak (just a volunteer chamber of commerce official) but it has received a Quik-Trak Machine.